The chatter and the headlines have been pretty excited. “The House Government Oversight Committee Chides the SEC Over Low Quality XBRL Data” is about as exciting as political theater about XBRL can get. However, this kerfuffle actually means only one thing: The quality of XBRL filings is going to have to improve, and soon. When Daryl Issa, the typically anti-regulation Republican Representative, calls the Obama-appointed Chair of the SEC, on the carpet over the quality of the XBRL data, the take-away is bigger than political bickering — It’s that the movement toward a higher standard for XBRL filings is now too fast for a u-turn. XBRL is here to stay; only the height of the bar will change. With his September 10th letter, Daryl Issa openly questioned the SEC’s efforts to move toward the use, analysis, and enforcement of XBRL data. Even a cursory glance at the code being created by in-house filers and by some of the outsource providers will show that Issa’s criticism is completely valid. Additionally, if his numbers are accurate—1.4 million errors found with zero Comment Letters sent—the SEC has a fair amount of work to do to bring a critical mass of the XBRL filings in line with the necessary standards of usability. All that being said, however, one cannot rightfully conclude that Mary Jo White, the SEC Chair, is not committed to XBRL or the enforcement of a higher standard for it. Since her appointment to the Chair, she has established three new fraud detection initiatives that will certainly be utilizing XBRL data as a primary element. The SEC has also recently rolled out its AQM-Robocop tool that will be analyzing XBRL quality on an automated basis every day. The House Government Oversight Committee wants enforcement of higher quality XBRL data, and the SEC already agrees. If you’re an SEC Filer, it’s time to be certain your filings are of the highest quality possible. 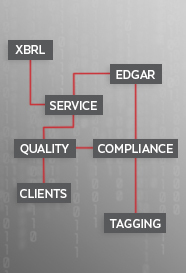 RDG Filings offers exhaustive XBRL Quality Assurance Services. RDG has the knowledge, expertise, and experience to ensure that your XBRL documents are usable for the analysts and not vulnerable to the AQM-RoboCop and any future analysis tools deployed by the SEC.